The Science Fiction Critic - ZineWiki - the history and culture of zines, independent media and the small press. 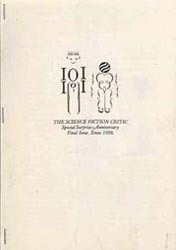 The Science Fiction Critic was a science fiction fanzine by Claire P. Beck. The Science Fiction Critic began life in as Science Fiction Review. It was first published in Reno, Nevada, U.S.A. from November 1935 till December 1936, and then by The Futile Press in Lakeport, California, U.S.A. It was a digest sized zine of around 14 pages and was initially published monthly. The first two issues were mimeographed. The third issue, released January 1936, introduces the change of name to The Science Fiction Critic and is letter pressed and side sewn. No.1, November 1935. The first of 14 issues. No. 2, December 1935, included the first appearance of editor Beck's column "Hammer and Tongs" and the article "A Slip-Back in STF" by James Blish (The Planeteer). No. 5, June 1936, includes a page by Hogo Gernsback concerning the discontinuation of Wonder Stories. No. 6, December 1936, is the first issue to be published in Lakeport under the Futile Press imprint. Contributors include Frederik Pohl (The International Observer of Science and Science Fiction). No. 8, March 1937, includes the article "Extrapolation - And Error", by John W. Campbell, Jr. and an article on Clark Ashton Smith's stone carvings and an announcement of two books to be published by The Futile Press. No. 9, May 1937, includes the article "Was Weinbaum Great? ", by Sam Moskowitz (Helios) and a letter from Clark Ashton Smith concerning the death of H. P. Lovecraft. No. 10, July 1937 includes the unsigned article "Some Notes On Lovecraft" and came with a supplementary advertising leaf announcing the Futile Press publication of Clark Ashton Smith's Nero And Other Poems. No. 11, October 1937, includes the article "Weinbaum Was Great", by Robert W. Lowdnes. No 12, (Vol. 2 No. 1), January 1938 is edited by Claire Beck and Groo Beck. No. 13, (Vol. 2 No. 2) March 1938, includes "Six Letters" by H. P. Lovecraft, three written to James Blish and William H. Miller, editors of The Planeteer, and three written to Nils Helmer Frome, editor of Supramundane Stories. No. 14, (Vol. 2, No. 3) July 1938, is edited by Groo Beck and includes "Science Fiction and Ethics" by R. A. W. Lowdnes. As announced on the cover, this is the final issue. Other contributions came from Willis Conover, Jr. (Science-Fantasy Correspondent), John B. Michel ( The International Observer, Terrible Tales of Tittering Terror), William Miller, Jr. (Fantasy Fiction Pictorial), D.R. Smith, and Louis C. Smith. This page was last modified on 4 April 2012, at 12:07.